Romance Content: The second half of the book was all about romance. I don’t recall a lot of kisses, etc, but it was too much for me. This is going to be one of my absolute favorite books. That’s what I was thinking during the first part of this book. It was simply perfect! The lessons were wonderful, the characters were darling (okay, so some of them were mean sometimes, but I still love them), and it was pure delight to read. I loved it! I decided that I was going to let all of my friends borrow it, and add it to my read-again-and-again Goodreads shelf… you get the idea. Well, after I read a little less than half way through, that all changed. I loved Polly and her friends until they grew up, and then, at the “Six Years Later” chapter, I was disappointed. (Okay, maybe I’m being a bit melodramatic, but… I’m disappointed! And I wish they hadn’t grown up! To give Ms. Alcott some grace, though, it wasn’t all horrible after that chapter… but I still didn’t like it as much) Why, you ask? Well, the romance. It was almost a love triangle (although I’m not that familiar with those, I’m pretty sure that’s what it was)! To most people, this probably wouldn’t be a problem- they’d probably love it!- but to me, it was way overboard. It just went on and on! Polly’s depressed, Fanny’s depressed, but then it all comes out well and everyone lives happily ever after because they found their true loves… 😛 Yeah, I was not impressed. Oh, and another thing, Polly was very good (practically perfect) in the first half (actually, for basically the whole book), but it doesn’t talk much about Christ or if she was a Christian. I found that a bit odd. You make me want to read just the first half. Okay, that was probably the point of your review. 😉 Well, mission accomplished! 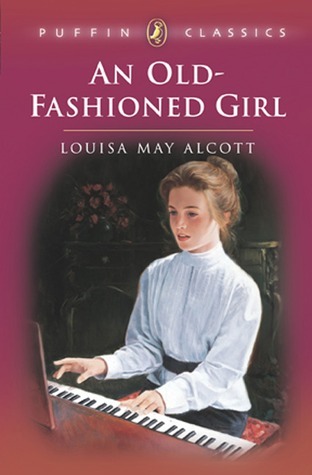 I have never read “Old Fashioned Girl” . My sister has the book since she was a young girl. You just answered something I had been wondering about!! 😀 I read this book several years ago — maybe ten or so — and it is one of the few Alcott books I haven’t gone back and re-read. I remember liking it until about halfway through, and then skipping through the last half of it…..but I couldn’t remember why. I actually have it in my pile of “to be re-read” books this year, and I keep moving it down, because all I remember is NOT liking it. Although I was thinking it was only because of the length, or maybe I was too young to fully enjoy it ( I *think* I was 11 when I read it. Maybe a bit younger.). Now I am thinking it was probably because of guy/girl relation ships, because when I was younger I didn’t want to read about it at ALL =) I even skipped parts in the old Elsie Dinsmore series by Martha Finley because of it. No, I haven’t read “Eight Cousins” or it’s sequel before. It sounds interesting! This looks like a (mostly) good book. I do like some romance in books, but definitely in moderation and in Christian circumstances. Too much is definitely not good.